Today’s Dining: Dazzle or Casual? Today’s homes are built with practicality in mind. Kitchen and dining areas have become the hub of the home – a place to relax, grab a bite and enjoy time with family and friends. Your furniture dealer will show you a variety of dining styles, all of which can be tailored to your own lifestyle and budget. Want to have a dazzling dining room? 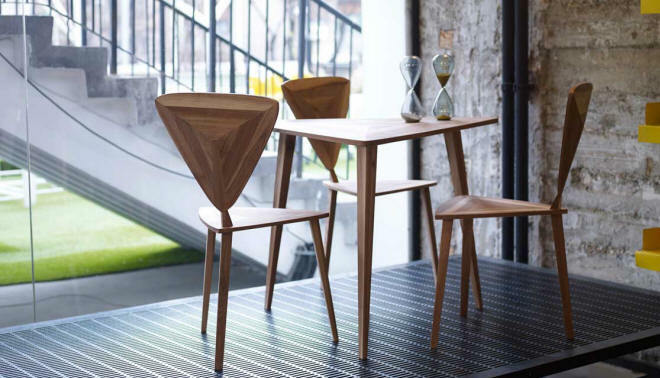 Then start with a striking set of chairs and a stunning table. With all of the chrome, brass, brushedsteel, polished lacquer, and aluminum creations, you can certainly achieve a setting that shines. Pairing these contemporary materials with glass, any of these contemporary materials will result in a dining table that is a standout. Chairs can match the table perfectly or you can search for ones that complement it beautifully. Whether your tastes lean toward the streamlined or the sculptural, there are plenty of up-to-date dining designs to choose from. By adding a coordinating curio, buffet, tea cart, or china cabinet you will have created a dining room that is certain to dazzle both family and friends. Does your home, apartment, or condo leave you challenged for dining space? Well, there’s no need to compromise on style because you’re short on space. Casual or “junior” dining room groups are a fast growing furniture trend offering the same smart styling as their larger counterparts. If you can’t accommodate a junior dining room, consider a casual dinette set, a perfect choice for your kitchen or dining area. Whatever your space limitations, your home furnishings retailer will show you multiple options for your lifestyle needs. Country dining “opens its arms” to you and your visitors. You are the first visitor you have to please, so choose furniture and materials that invite use. If they look well loved, they will add the informal element you crave. In general, country dining tends to offer rustic textures. Wicker, rattan, pine and cast iron are all less formal than glossy wood or sleek glass. Weathered and distressed objects will be right at home in a country atmosphere. Furniture is meant to be used and touched. Consider easy-care fabrics and stay away from shiny textiles or dry-clean only. Coarse weaves embody the casual style. You will feel right at home with denim, canvas and homespun cottons. A mixture of furnishings will relax your room. Uniformity is a trait of a formal style. Consider six vintage one-of-a-kind chairs with a similar shape and size. Or your chairs can all match, but the table could be different. Even one oddball chair at the end of the table as a focal point will make a casual decorating statement. Fabrics soften the edges. Dress down formal chairs and tables with slipcovers in textured fabrics and floor-length cotton tablecloths. Vintage table linens are still relatively easy to find in antique stores or even at your local flea market or yard sale. Keep in mind that the shape of furniture can affect the look of the room. A round table will soften a room with harsh corners. A corner cabinet is both space saving and softening. If your table and sideboard are all that you have in your dining room, the room will feel unbalanced. If you can’t afford a gorgeous hutch or Welsh cupboard, a set of high backed chairs will add the contrast of vertical height you need. Elbow room for guests should be between 20 and 24 inches wide and at least 15 inches deep. The center of the table should have a strip about 12 inches wide for serving dishes, centerpieces and candles.